It takes a few days to settle into the daily rhythms and sounds of a different country; when people eat, when shops are open and when to hide from the heat of the sun in the cool courtyard-facing room of your riad. In a Moroccan city the first thing to adjust to is the muezzins calling the faithful to prayer five times a day, the first just before dawn. The drawn out calls undulate, staggered and out of sync, from speakers on the many small mosques, the cries rising and falling over each other, creating odd unintentional harmonies and rhythms. Soon you orientate yourself by these prayer times, it comes as easily as using the chimes of a clock to mark the hours. The penultimate prayer call heralds sunset, when the square edges and flat tops of the old houses are picked out in orange light and the narrow streets below are already in darkness. Outside the medina stand the tower blocks and modern buildings of the colonial Ville Nouvelle. Beyond them the growing suburban sprawl of Rabat runs south and west to the horizon, a wall of shimmering electric flame kept at arms length, like many would-be invaders, by the fortified wall of the medina. One evening we see a muezzin in the lit-up doorway of a mosque at night, standing tall and proud in a simple green robe, eyes closed and hands clasped calmly together in front of him. He incants with power but without strain, the call to prayer bouncing off the warm stones of the now dark street and into the clear night sky, mingling with others at it rises to the stars. For western tourists like Sara and me this is the defining sound of the arab world, which even at the most western edge of Africa, you are unmistakably in. 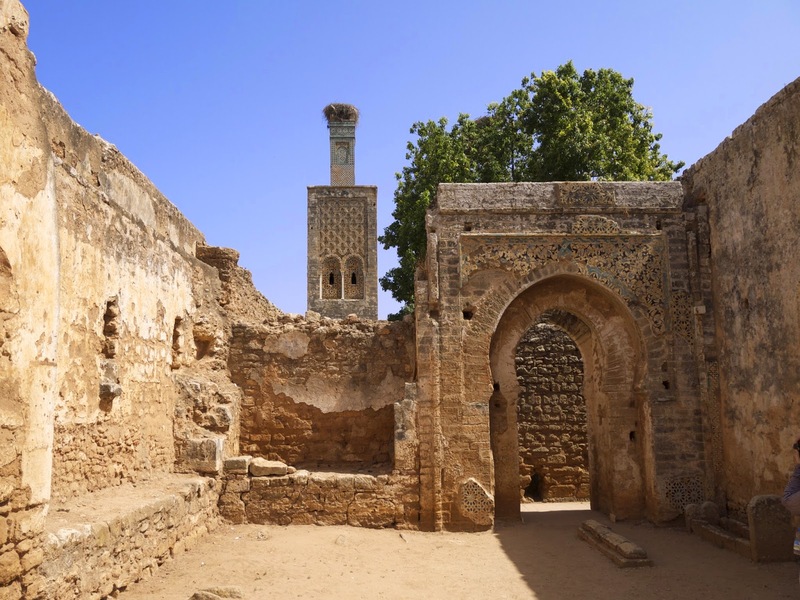 To the south east of the city sit the ruins of Chellah, the oldest inhabited settlement in the area and Rabat’s most interesting historical sight. Having been used by the Romans, as a necropolis and later by the Merinids until being abandoned in 1755 after the Lisbon earthquake the ruins inside are impressive, both in their completeness and ambition. The stones of a roman road and town centre are well preserved, as are a royal tomb and the pillars and rooms of a now roofless mosque. Around the ruins is a lush garden, giving some much needed shade and coolness in the middle of the day. The famed archeological museum, hidden down a mostly residential street, appeared sad. The walls sported empty brackets, display cases had labelled gaps and bare plinths were common. The exhibits that weren’t missing looked interesting, but so little information or context was given that it was hard to know what you were looking at and what significance it had. The four, probably unintentionally sparse, rooms looked distinctly unloved. Perhaps the museum is about to undergo an unannounced renovation. On the way out we were hailed by a large tourist, wielding a tattered guidebook and with suncream stuck in his stubbly beard, excitedly asking if we’d found the museum. He’d been searching for it for almost an hour, spurred on by the positive description in his book. We helped him on his way, but not before trying to damp his excitement about the quality of the museum. Hopefully he wasn’t too disappointed after all that searching. Better not to believe everything in guidebooks. Rabat sits on the Atlantic edge, on the southern shore of the Bouregreg estuary. On the north side sits the now smaller sister city of Salé. Both were great trading ports before the river became too silted and shallow for large modern ships. The two cities were even briefly a barbary pirate state in the 17th century. The coast in Rabat is a rocky affair, with small grubby beaches either side of the estuary itself. Still Moroccans come and parade along the sea wall above the rocks, teenage couples teasing each other out of sight of their parents, as happens the world over. Hormones and illicit teenage kicks being universal. Anglers stand on the rocks, casting their lines into the swell between lumps of styrofoam and clusters of plastic bottles that bob in the surf. The water front area is mostly bluntly functional, with a main road and old housing blocks. Between the sea and the city, both in Rabat and Salé, are expansive graveyards. Perhaps it’s a religious edict, but here the dead are given the grandest sea views. One exception to the otherwise drab use of coast is the small Kasbah Udayas, a small fortified town perched on the rocks overlooking the estuary. Inside its red walls the buildings are all painted blue up to waist hight and then white until they reach the sky. Perhaps it’s means to mimic the horizon for returning seafarers, coming from the expanse and glare of the open sea into the small dark streets of the town. This promontory used to guard the busy harbour, but now, apart from the slow lonely dredger, the biggest ships that come in are private yachts. 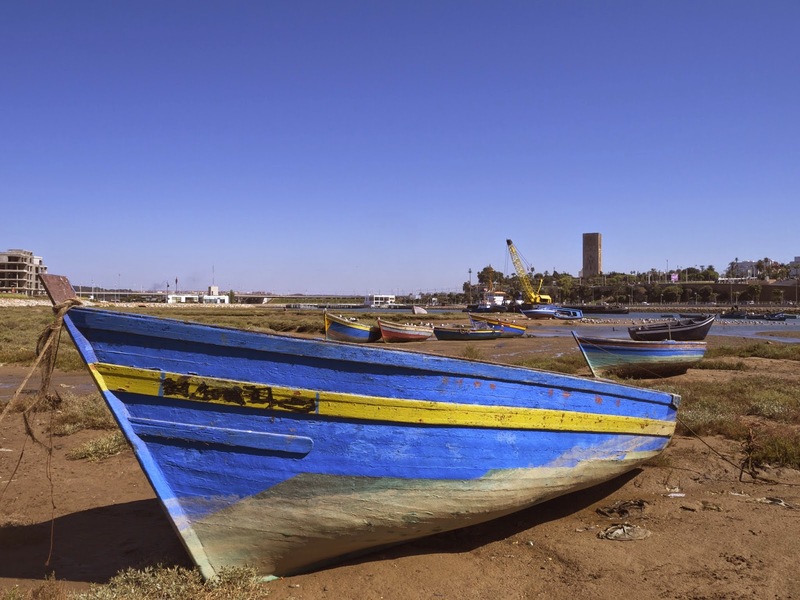 The only working boats left are small blue high-prowed wooden fishing boats that sit on the tidal flats in front of a development of modular modern apartments at the Salé marina that could be anywhere in the world. Salé is expanding and modernising, adding suburbs and becoming a dormitory town for Rabat. At the base of the new road and tram bridge across the river sit blocks of land waiting for houses and shops, the McDonalds is already there selling McArabias, a menu item that would be cheap comedian’s parody of globalisation if it wasn’t a real product. It’s easy to smirk at this conquering western brand that is either adapting or aping, depending how cynical you’re feeling, to local tastes. It at least shows that Rabat is doing business of its own in exchange and there is the native prosperity to support such a franchise; the restaurant is nowhere near anything of interest for visitors. As the modern capitol Rabat has enough life and business of it’s own that it doesn’t need tourists. This makes it more relaxing to visit, as fewer people are trying to get money out of you. While taxi drivers, ever a law unto themselves, still fight hard to rip you off, they at least have the kindness to phone ahead to your hotel for clearer directions and to have you met on your arrival. We even managed to get a taxi that ran on the meter, though the roof of the ancient Fiat was so bowed in that it must have been rolled many times and sitting up straight in the back wasn’t possible. A few of the souks near the edge of the medina are more touristy, but you’re still in a crowd of locals doing their regular shopping, rummaging through the piles of clothes on sale and arguing loudly with the grocer. The boy with a sink on a pair of legs demonstrating a grabbing, plug-hole clearing, metal snake is not there trying to impress sunburnt tourists. Sitting on a pavement cafe and enjoying a sweet mint tea, the staple brew of moroccans, you are only accosted by the same cigarette or tissue sellers that all the other patrons are. For a more undisturbed perch the balcony of the cinema Carrion Cafe on Avenue Mohammed V in the Ville Nouvelle is recommended, even if you are then slightly more aloof from the details of everyday life. At night the main, city facing, gates of the medina are almost clogged solid with people and sellers. The poorest setting up folding tables in the street selling curious collections of items, such as the boy selling bright orange wind-up drumming bears. He has them arranged in formation on his little table, plucking them one at a time out of their ranks to wind them up. Along the wall to the east many little grill stalls open up, illuminated by the warm white glow of gas lamps fed straight from camping canisters. No matter how crowded the narrow streets of the medina there’s always room for a scooter. They push through any gap and accelerate wildly into any open space, narrowly avoiding carts of tunas cactus fruit and beggars sat in the street. As you walk north the medina becomes quieter, and soon you are in residential streets, where families and courtyards hide behind windowless walls and anonymous doors. Only the larger streets have occasional convenience shops or a barber. Often the last sounds heard in the medina before the night settles in are the happy cries and shouts of children playing football in the crossroads of side streets until they are called in for bed. Then, until the dawn prayer call, away from the markets all is quiet for a while.